Labor Day weekend all around the country is typically saying goodbye to the summer but the holiday weekend at Raceway Park means racing and lots of it. Saturday has a full schedule of Veteran class and Vintage racing and Sunday its back to a complete schedule of all of the normal classes. 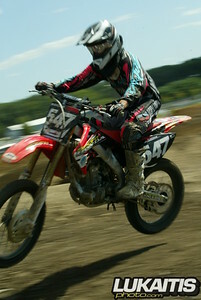 One of the most dominant riders at Raceway Park this season has been Mt. Holly Suzuki backed Michael Sowa. Sowa has consistently been a top runner in the 125 Novice class but it’s on the big bikes where he really shines. 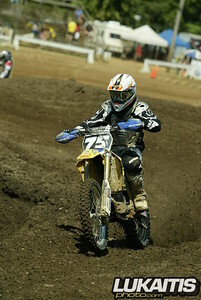 Sowa’s Suzuki 450 has been all but unstoppable in the 250 Novice class. Combined with a seventh-place finish at Loretta Lynn’s this summer and a six-race win streak coming into Sunday’s race Sowa was clearly the man to beat. With four moto wins and two second-place finishes, he went home with the 125 and 250 Novice class overalls and second overall in the Open Four-Stroke class. Look for Sowa to make some noise next season in the amateur class. With the annual Kawasaki Team Green Race of Champions only two races away many racers were trying to dial in the track and their setup in hopes of attracting some national attention at this premier event. A couple such riders were Expert class winners Ronnie Stewart and Adam Blessing. Stewart was the 250 Expert class winner with 2-1 moto scores with Sport Honda/Boyesen backed Blessing (1-2) in second and Bryan Wallace (5-2) in third. Blessing turned the tables on Stewart in 125 class racing by winning both motos on his way to the overall. Dakota Kessler (2-2) was second and Stewart (3-4) was third.